Temperature and relative humidity monitoring is essential for the long term preservation of sensitive items in museum collections. Monitoring allows environmental conditions to be controlled to help with conservation of the collections, and follows best practice guidelines for the UK national museum accreditation scheme. University College London (UCL) has three public museums: the Petrie Museum of Egyptian Archaeology, the Grant Museum of Zoology and UCL Art Museum. UCL also has a wide variety of other teaching and research collections, including anthropology, archaeology, medical sciences, engineering and geology. Susi Pancaldo is the Senior Conservator for UCL's Public and Cultural Engagement Department (UCL-PACE). 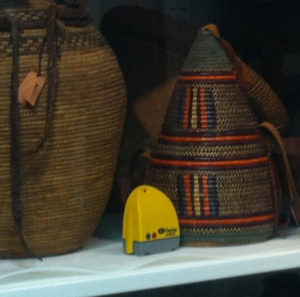 Susi is using Tinytag temperature and relative humidity data loggers as a key part of the environmental monitoring programme, which aims to evaluate the quality of display and storage facilities holding the collections. This information is used to advise collections managers, curators and Estates and Facilities staff about conditions in these areas so that improvements can be made as needed. Long term monitoring of the collections spaces also follows required museum best practice guidelines, for example, for the UK national accreditation scheme. A total of 44 Tinytag Ultra 2 and View 2 data loggers monitor relative humidity and temperature conditions, some alongside a telemetric monitoring system. Tinytags are deployed in smaller collections for regular, long term monitoring, and also on an ad-hoc basis where required to help solve localised environmental issues. In areas where conditions are known to be quite stable, the data is examined quarterly and/or annually. In problem areas, the data is checked more frequently. Environmental summaries are prepared annually so managers can evaluate the overall situation. In addition, the Department supports teaching in the Institute of Archaeology's Museums Studies and Conservation training programmes, and data sets are often downloaded for specific student projects. Susi comments, "I chose Tinytags because of their reputation for reliability. Some of our Tinytags are moved about a lot, so robustness is important. They are also easy to find - especially the bright yellow units - they have a long battery life, and the software is easy to use."